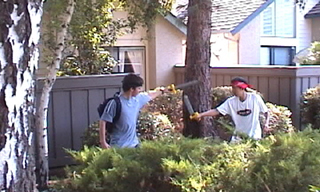 The very first of the infamous "Fight Movie" series, this was also the very first done with the DMI crew we know today. Created in two versions with alternate endings. A duel. What else do you need to know? At the beginning of the 2004-05 school year, Richard viewed all the Dead Moose, Inc. movies, and had one criticism: "They need a plot." Suddenly, that melted into "I would like to do a bunch of movies that are just fight scenes, without a plot." 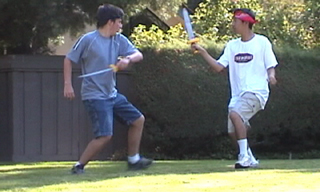 With Philipe's toy swords brought onto set and an hour of shooting time, this was the most fun and least stressful filmmaking would ever be. Now for the main series.